Flawless media playback; Supports all major formats; Can install Android apps and games; Remote control supports motion gaming; Upgradeable software. Sluggish interface; Takes over two minutes to boot; Lacks an "off" button. Media players, gaming consoles, computers, and Android devices are all too common a sight nowadays. However, the EvoTV from Amkette attempts to provide the goodness of all four in a single box. This unique gizmo, which is more than just a media player running on Android 2.3 (Gingerbread), can truly convert your existing TV into a Smart TV, extending its usability far beyond what its manufacturer had intended. Let us take a closer look at this one-of-a-kind gizmo. 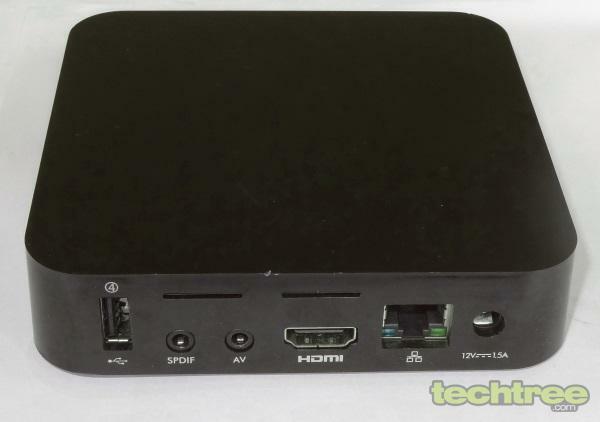 The EvoTV is housed in a small black polymer box with rounded corners. The top surface has a matte finish, so you don't have to worry about it attracting smudges. The construction appears to be sturdy, as the product managed to survive an "accidental" fall from a metre high onto the floor without so much as a scratch. It has dimensions of 4.6" (w) x 4.6" (d) x 1" (h) and tips the scales at 277 grammes. Four small rubber feet at the bottom keep it firmly planted on the surface. The front sports the company logo and a blue LED that shines when the device is powered on. The right side has three USB 2.0 ports and an SD \ MMC memory card slot. The rest of the ports and connectors are situated on the rear as shown in the image below. Wi-Fi (802.11 b/g/n) is built into the device, so you don't need a separate adapter for that connectivity option. On the hardware front, the EvoTV comes with a customised version of Gingerbread and is powered by an ARM Cortex A9 CPU and ARM Mali 400 GPU. It has 4 GB of internal storage and 512 MB of RAM. The most interesting part of the package is the bundled remote control, which doubles up as a motion control device that allows you to play games on the EvoTV. It looks very similar to the Nintendo Wii remote, right down to the included wrist strap. The rounded shape of the remote makes it easy and comfortable to grip. Two touch-sensitive pads near the top and bottom are used for gaming. The remote can also function as an air mouse, with a clickable button present on the underside. It even has a speaker and microphone that can be used for Skype chat, meaning you no longer have to be next to the base unit during chats. Working on the 2.4 GHz radio frequency, the remote does not require a direct line of sight to operate. 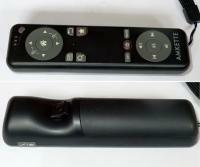 Though Amkette claims a range of 10 metres for the remote, the effective range seems to be about 5 metres (a little over 15 feet) from the device, after which the connectivity becomes erratic. The remote is powered by an inbuilt rechargeable battery that can be replenished via the provided mini-USB cable. On the flip side, while basic functions such as play, pause, forward, rewind, and volume have been covered, the remote lacks a few advanced buttons that are expected on media player remote controls, such those for the subtitles and audio language. A mute button is also missing, but its function can be accessed simply by double-pressing the volume decrease button. However, since this is not mentioned in the manual or anywhere else, this will prove to be a nuisance for most users, who will desperately hunt for the mute button when the time comes to quickly reduce the volume. On powering it up, the EvoTV takes just under 2.5 minutes to boot. While I do understand that this device is in many ways similar to a computer, the start time is still unacceptably long. Another complaint about the performance is the device's sluggish UI, which seems to take its own sweet time to respond to your commands. The customised interface has several sections such as YouTube Viewer, Applications, Web, Media Center, TV Shows, and Games. Let us first take a look at the media player functionality of the device. Media playback is achieved via the customised media player that can handle most video (MPEG-1\2\4, MKV, MOV, M2TS), audio (MP3, WAV, WMV, OGG), and image file formats (JPEG, BMP, PNG, GIF). You can find a list of all supported formats here. You can connect several external storage devices at a time through the USB ports and even access them simultaneously. The player has no issues with USB hard drives as large as 750 GB. The on-screen controls are similar to what you see in media players on Android phones and tablets. Playback performance is flawless at 720p as well as 1080p at 50 and 60 Hz, save for rare stutters when the action gets very intense. Subtitles in several different file formats are also supported. Up to 7.1-channel audio output is available via HDMI as well as S/PDIF, provided you have a capable sound system. DLNA technology is also present to allow playback from other devices on the network. Gaming is a joy using the motion-control capability of the remote control. I tried to gauge the learning curve by handing it over to my four-year-old niece, and she was happily playing Angry Birds within a couple of minutes. There are quite a few other Android games that you can download and enjoy this feature with. The EvoTV lets you browse websites, with full support for Adobe Flash. You can also chat with your friends using IM services such as Skype. Social networking support is present, with apps for the popular services. The YouTube Viewer and My YT sections allow you to view videos online. The TV Shows feature has a selection of Indian TV serials that can be viewed online. The EvoTV Store is a customised version of Google Play that lets you purchase and download apps and games to the device. If you prefer Google Play instead, that route is also open to you. You can install your favourite media player to play formats that are not supported by the stock video player, thus greatly extending the functionality of the device. Another nifty feature is the inbuilt torrent client, and when clubbed with an external USB hard disk, effectively turns the EvoTV into an inexpensive download rig that consumes very little electricity (approx 5 Watts). Accessories and peripherals, such as the Wi-Key Touch Wireless Keyboard (priced at Rs 2400), allow it to be used as a computing device. The EvoTV does heat up a bit after some elapsed time, but this is normal and can be ignored. What can't be overlooked however, is a bizarre oversight — there is no way to switch off the unit; you can at best only reboot it. Fortunately, Amkette's tech support is aware of the issue and informed me that an update to resolve it will be released in a couple of weeks. Until then, you will have to power off the unit directly from its wall socket. 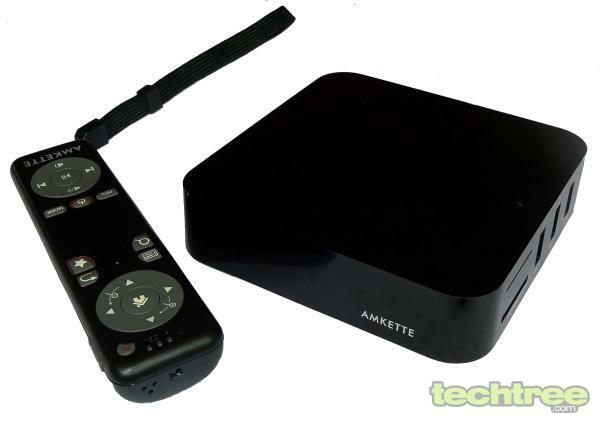 The Amkette EvoTV is a unique device that converts your boring television into a really Smart TV. While its UI displays some lag, it performs well in media playback as well as light gaming. Its internet features, such as web browsing, social networking, streaming media, IM chat, and torrent client place it way ahead of rival media players currently available in the market. Its motion-sensing remote control is another fun addition. Overall, this would have made for a very good buy, had the asking rate been lower. Considering its current offer price of Rs 10,000 though, I'd much rather wait for a price drop. Check out the gallery below for more images of the product.